In A Study in Scarlet, the world’s most famous detective, Sherlock Holmes, notes that “By a man’s fingernails…a man’s calling is plainly revealed.” Some may question the usefulness of nails—especially the ones found on toes—in an evolutionary context, but toenails can offer some insight into your body’s inner workings. Thyroid conditions and psoriasis – Nails that are brittle or crack or split often and with ease may be a sign of a medical condition, especially if there is no other apparent cause for this to happen. Crohn’s disease and anemia – Brittle nails that easily flake apart or are unusually soft to the touch may be the result of protein deficiency, but it can also be a sign of anemia or Crohn’s disease. Onychomycosis – More commonly known as a fungal nail infection, your toenails may be indicating this condition when they become discolored (typically yellow), break or crumble with ease, and even emit a foul smell. When this happens frequently, it may be an indication of poor circulation, a weakened immune system, or possibly diabetes. Cirrhosis – This liver disease can lead to white nails that have a rim of darker coloration at the front edge of the nail. Other conditions this might indicate include chronic renal failure, diabetes mellitus, chronic hypoalbuminemia, congestive heart failure, and Hodgkin’s lymphoma. Poor circulation – A blue nailbed (cyanosis) is an indication of poorly oxygenated blood and requires medical attention. Schedule an appointment with our office and we can help. Melanoma – Skin cancer on the feet is rare, but very serious. If you observe black lines or dark spots in a nail—especially when there wasn’t any physical trauma to the toe—this could be a potential read flag for melanoma. Come in to have the situation evaluated as soon as possible because early detection and treatment presents the best chance of successful recovery. 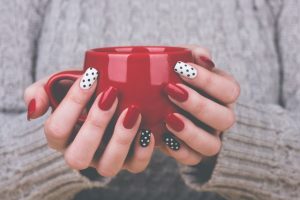 The physical state of your nails can clue you in to the fact something is wrong and give you part of the story, but it’s best to have a medical professional provide an evaluation. If you have brittle, ridged, split, or cracked, or discolored toenails, don’t hesitate to contact Dallas Podiatry Works. Give us a call toll-free at 972.566.7474 or schedule an appointment at either our Plano or Dallas, TX offices through our online form today.